AMSAT P3A, P3B, P3C and P3E were a series of amateur satellites developed by AMSAT-DL and AMSAT-NA operating from highly eccentric orbits. AMSAT P3A (Phase 3A) was the first satellite of the AMSAT Phase 3. It was developed in the 70ies by AMSAT-DL and AMSAT-NA. It carried a communication payload consisting of 50 Watt Mode-B (435 MHz → 146 MHz) linear-transponders. 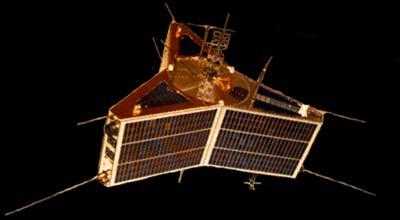 The satellite was to be inserted in a highly eccentric 12 hour Molniya-orbit by its on board Star-13C kick motor. The satellite was lost during a launch failure off the Ariane-1 carrier rocket. AMSAT P3B (Phase 3B) was a similar repeat of the former satellite. It carried two transponders. The Mode-B transponder receives in the 70 cm-Band and transmits in the 2 m-Band. It has a bandwidth of 150 kHz for 50 simultaneous connections. The Mode-L transponder receives in the 23 cm-Band and transmits in the 70 cm band with a bandwidth of 800 kHz for 300 simultaneous connections. In contrast to P3A, it carried a liquid bipropellant propulsion system featuring a S400 engine. After reaching an highly elliptical 12 hour orbit, it was renamed OSCAR 10 (AO 10). The satellite collided after separation with the upper stage, which affected the propulsion system, so the satellite could not change the inclination to 57°. The satellite lost attitude control in December 1986, but remained partially operational until 2003. AMSAT P3C (Phase 3C) was a repeat of P3B. It was renamed OSCAR 13 (AO 13) in orbit. It operated until November 1996, when the perigee dropped into the upper atmosphere layers, destroying the solar panels and finally leading to reentry on 6 December 1996. AMSAT P3E (Phase 3E) is a dedicated communication and scientific platform for a highly elliptical orbit around Earth. The spacecraft will be created in a joint process together with the AMSAT P5A Mars mission by an international team under leadership of AMSAT-DL and continues the successful series of AMSAT-Phase 3 satellites. Additionally the spacecraft will be a test bench for technology developed for the Mars mission. The main task of P3E is to act as communication platform for radio amateurs worldwide. A launch was planned in the period 2004 to 2006, but until now, no flight opportunity could be secured. Currently the project is on hold due to the unavailability of affordable launch opportunities. A potential launch opportunity arose in 2015, which involved the completition of the satellite at Virginia Tech university and a launch on a US rocket, but eventually was not used. AMSAT P3E (Phase 3E, AMSAT P3-Express) - on hold with ?